First of all, let’s be honest, no one is making tons of money on the stock market right now. If you are, you’re probably not reading this blog post. The average person invests money in a bunch of different companies – hundreds in fact. The benefit of this broad strategy is that as the market grows, as it tends to do over time, the investor takes advantage of the market’s overall trajectory. But it’s expensive to trade stocks, and most people aren’t educated enough about the merits and weaknesses of individual stocks to make good choices. So companies like Vanguard started to group stocks together into funds (mutual funds) and shares of mutual funds which trade just like stocks (ETFs). These funds and ETFs enable investors to buy up stakes in lots of different stocks, without having to pay the price or do the learning required for investment in hundreds of different transactions. Betterment users have portfolios which consist of ETFs. But why do people need a service like Betterment to set up their ETF portfolio? The question is, basically: simplicity. Betterment understands that most people don’t want to research their individual ETFs, at least enough to create for themselves a truly diversified portfolio. Betterment gives people ETFs based on market prices around the world, including major markets like those in the US, but including developing markets like India. Thing is, Betterment doesn’t do anything for an investor that an investor couldn’t do for him/herself. 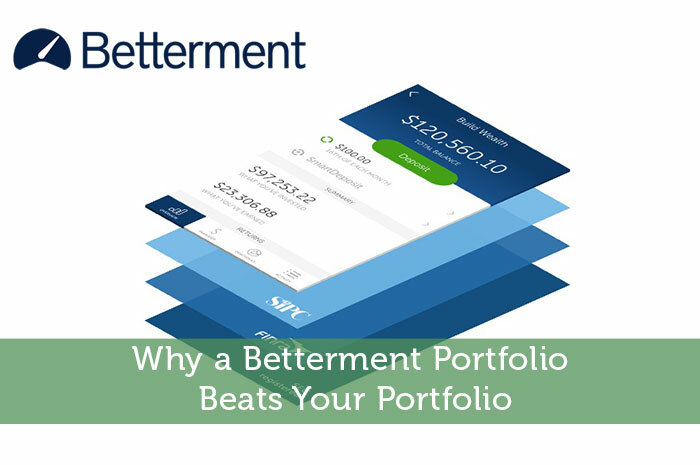 This begs the question: why do Betterment portfolios frequently perform better than portfolios of the average investor? The answer is pretty simple – Betterment is more thorough than the average person is able to be. To explain this let’s use an example from the world of personal computers. …if you have the skills, time, and personality to do it. Lots of people don’t. Investing is kind of the same way. Sure, there’s nothing preventing you from researching your own ETFs and assembling your own portfolio, even ripping off the models used by Betterment. But this takes research, and hours of work. Some people love this process and relish the struggle to assemble the most efficient portfolio possible. Other people can’t be bothered. Even if they try to DIY, they cut corners, burn out, and settle for a portfolio that is less than what it could be. Investors see this in the professional world all the time. Professional investment managers are notoriously inconsistent. And, mind you, these people are the ones who make livings on managing others’ portfolios. Barely one in five can make their clients money each year. Honestly, it’s important to consider your own performance in light of the record of these professionals. Are your portfolio picks likely to beat the market? What happens if you don’t actually know what you’re doing all that well? The end result is that most people can’t beat Betterment’s returns. The ETFs they choose are chosen for a reason. Betterment’s board of directors have a lot of expertise in the marketplace. They’ve chosen funds which are meant to perform well, based on the expectations of a variety of users, at all levels of risk tolerance. It’s a fancy platform. DIY experts might scoff at it. But for the most part, even the best DIY investor can’t beat Betterment’s returns by much. Even if they can squeak out a percentage point extra, or so, it’s not worth the extra time and effort, at least as far as the average investor is concerned. In the end, you’ll have to do your own research, and make your own choices. Betterment doesn’t do anything you couldn’t do for yourself, in theory. But you’ll have to be something of a superstar to beat Betterment by anything significant, at least if we’re talking annual returns. And even if you do manage to beat this service, can you do so by margins which make the effort worth it? Remember, time is money. Consider your time and money, and make your investment decision carefully.